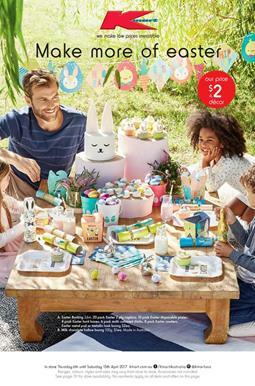 Easter treats, chocolates and Easter bunny are all in the new catalogue of Kmart which is valid until 15 April. Find out new lower prices of favourite products that are regularly need in parties, as treats and giftables. You should browse the entire catalogue if you like to get all details. Easter eggs are available on pg 2-3. Baubles and eggs are on sale. Milk chocolate bunny for only $1 can be seen on pg 4. Also decorative products like Easter tree is in the list of Kmart. Lindt Lindor chocolates including gold bunny of which some are exclusive to Kmart Catalogue. Kmart has a huge sale of Easter chocolates and eggs on this catalogue. I think you must browse the catalogue not to miss out anything. On pg 10 Easter chocolates ($6.75 each) is browsable. Find Cadbury Dairy Milk, Mixed Eggs and other products on pg 10-11. Kmart's treat range including M&M's, MaltEaster, Star Wars Easter chocolate eggs are featured on pg 12-13. Moreover, Kmart Toy sale for holidays as giftables, can be browsed on pg 16&17. Check out best toys for kids, and other entertainment products. Follow on social media for Kmart Catalogue Easter deals and never miss out anything.